Giffin, 32, knows it takes time to make meals worthy of an elite palate. As a teen in his native Montpelier, Giffin worked as a dishwasher at Royal Orchid Restaurant; he left high school three months early to travel to Thailand with one of his colleagues. Later, while studying at the Culinary Institute of America, he returned to Thailand and spent his externship cooking at the famous Pae Krung Kao, owned by the father of Royal Orchid co-owner Claire Jilandharn. The then-80-year-old architect’s goal was to serve food like his grandmother had made a century earlier. His customers included celebrities such as Thailand’s crown princess. When he opened Sukho Thai last month, Giffin had a goal that was no less ambitious — or personal. With the help of his wife, Look-Pla, and her parents, the young chef is trying to bring authentic tastes of Thailand to Vermont. And he’s not the only one. Sukho Thai occupies the space filled until recently by Tiny Thai Restaurant, whose owners, Paul and Pui Ciosek, have downsized their real estate but not their plans. At their remaining Winooski location, the Cioseks are competing with Giffin to make the best, most down-to-earth Thai food in the state. That may be a loss for the two couples — Giffin says relations are chilly between the former friends — but it’s a gain for local diners. Tiny Thai has just launched a new menu catering to both Thai natives and Americans who have eaten the real deal in Asia. On it, those offerings come with a no-nonsense warning: “Be aware that some of these dishes are very spicy and are aimed towards those who are Thai or have lived in Thailand. No alterations, substitutions or returns.” Looking to please all potential customers, the Cioseks have also added a vegan bill of fare, new desserts and designations for their gluten-free dishes. “Pretty much, my wife and I decided we had dishes we wanted to have — things I remember from Thailand, when the trucks are rolling by and sweat’s rolling down your face,” says Paul Ciosek. A computer programmer who spent his early years in St. George, Ciosek worked in Thailand for four years. He says he became so enraptured with the street-food culture that vendors would occasionally let him make a few dishes on their carts, still wearing his suit and tie from work. “I learned a lot that way, just by trying things,” he says. One dish reminiscent of street fare is krapow gai kai dow. The mound of ground chicken is flavored with garlic, basil and a liberal portion of fresh chile. An over-easy egg with a crusty exterior adds a creamy sauce when broken on top. The chef plates this with matchstick-thin carrot strips that spell out the words “Tiny Thai” and a “rose” made of carefully layered petals of fresh tomato and spinach for leaves. Ciosek encourages diners to eat the dish with a spoon, a Western innovation introduced to Siam by King Mongkut, the royal depicted in the Rodgers and Hammerstein musical The King and I.
Krapow gai kai dow is also available at Sukho Thai, but it tastes wildly different there, just as dishes in Thailand vary from region to region. For starters, Giffin fries and seasons the basil leaves for a cri spy texture and an even more vivid flavor. Chunky slices of onion and green beans make the dish more like a warm salad than Tiny Thai’s, which suggests ethnic sloppy joes. In Giffin’s version, large slices of Thai bird’s-eye chiles add heat, but it’s calmed by musky fish sauce, vinegar and a hint of palm sugar. This balance of flavors is key to a successful Thai dining experience, says Giffin. In upcoming weeks, he’ll roll out a new menu, to include many of the authentic dishes he now serves only as specials. With it, he’ll introduce a DIY approach to flavoring dishes common in the old country. “The plan is, on each table, there’s gonna be a jar of fish sauce, sugar, chile and vinegar,” he says. “That’s just how you eat in Thailand — you’re responsible for adjusting it yourself.” The four condiments reflect the four fundamental tastes of Thai food: bitter, sweet, spicy and sour. Even simple dishes have seen dramatic changes at Sukho Thai. Going by its menu description, moo ping, a skewered pork appetizer, may sound similar to the lean, satay-like dish at Tiny Thai. However, at the newer restaurant, the chunks of juicy, slightly fatty tenderloin are coated in a slick of coconut-flavored lacquer that chars at its peaks on the grill. The result tastes like it came straight from a Bangkok night market. That may be thanks to Giffin’s mother-in-law, Onun Chansook. 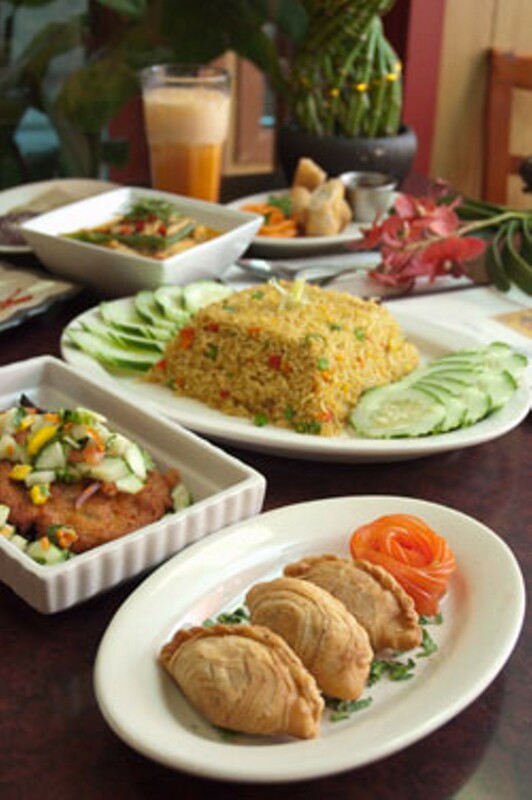 She makes or oversees the creation of all the appetizers at Sukho Thai, including puff pastry filled with curry-flavored potatoes and chicken; and tod mun gai, fried chicken patties redolent of lemongrass, dressed in a lime-flavored salsa of mango, cucumber, cilantro and onion. Chai Nat was chef-owner of restaurants in both Bangkok and her native Chanat before she came to the U.S. and ran eateries in Los Angeles. She speaks little English, but she’s eager to meet customers and make sure they’re pleased with her handiwork. 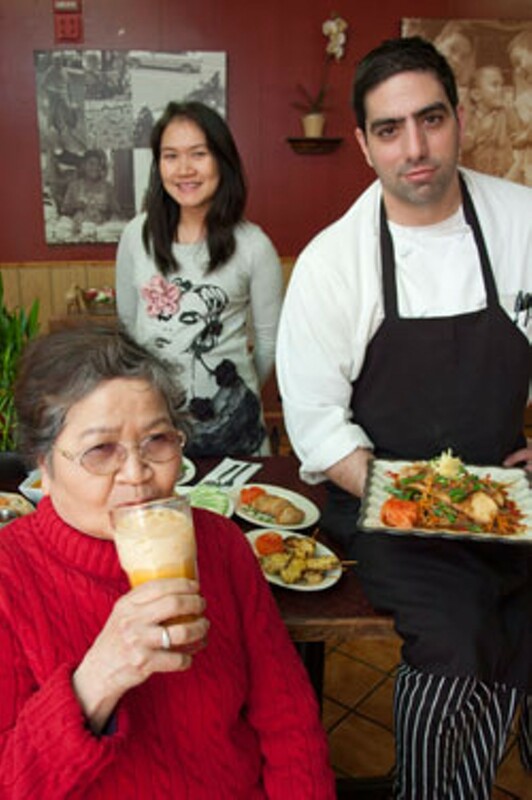 Though he gets help from his talented mother-in-law, Giffin himself learned plenty about the history of Thai food by working his way up from dishwasher to chef-owner in Thai restaurants. He illustrates that history with a series of dishes. Moo palo, a stew of long-braised pork, tofu and eggs, is flavored with five-spice powder, a seasoning first brought to Thailand by natives of China migrating south. The star anise and aromatic cinnamon sing of the land they left 1000 years ago. So does another dish that starts with a rich, almost creamy duck broth in a bowl of skinny wheat ba mee noodles. The sweet red cha siu pork that fills the bowl makes that soup’s Chinese heritage obvious. Other Thai tastes come from the nation’s west — namely, curry imported by Indians. It flavors a coconut-imbued duck stew, but also Giffin’s surprisingly complex khao pat sapparot, a fried-rice dish dotted with pineapple, cashews and tofu. The fusion is strikingly similar to the Indonesian fried rice called nasi goreng. In dishes with ancient roots, such as the moo palo (which is also prepared masterfully at Tiny Thai), Giffin replaces bird’s-eye chiles with native white pepper. He explains that the red peppers many diners associate with Thai cuisine were actually introduced in the 1600s by Spanish explorers. Thai cooks found them ideal for covering up rancid meat pre-refrigeration, as well as a perfect match for classic native flavors. Giffin gets many of his hard-to-find ingredients from Boston, including five different types of soy sauce and the palm sugar he uses instead of cane sugar. Others come from Thai Phat Market in Burlington. Over at Tiny Thai, trying to up the ante against their new competition, the owners are looking even closer to home for their ingredients — to local farms. This summer, says Pui Ciosek, “We’re making a point to grow fresh vegetables when it’s available around here.” On March 2, she’ll meet with the Burlington Intervale Center’s New Farms for New Americans to discuss a plan for growing season. A former Tiny Thai employee owns Sol Fresh Farm in Hinesburg, which also will provide produce, including local lemongrass. The change should produce an even better version of Tiny Thai’s already fun dip dish nam prik. Raw broccoli, green beans and cucumbers are served sliced, along with pork rinds and hard-boiled eggs, ready to be slathered with the dip of the day. The pork dip is textural and full of sweet tamarind flavor, while an eggplant dip suggests Thai baba ghanoush, with a punch of lime and bird’s-eye chile. “We’re very excited!” Pui Ciosek says of the impending arrival of fresh ingredients. Now Vermonters can enjoy twice the comfort — and the spice.